In the early iChatAV days, one of the many things Steve Jobs called me was a "fuckchop". When I got to iPod, I thought it would make a nice title. 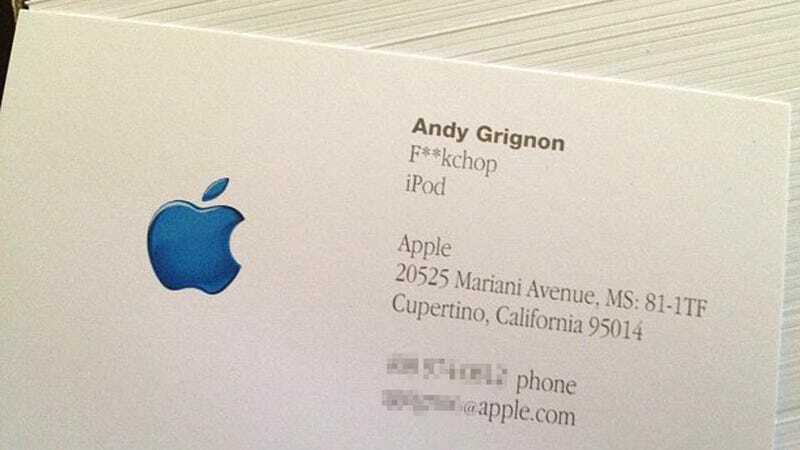 Mandy found some of my old Apple business cards. This one was great because after I submitted it for approval, I didn't hear anything for 2 weeks. Suspecting something was up, I visited Ruby and asked what was happening with my cards. He replied, "c'mon, that can't go on a card..." Not more than a few hours later, Apple Printing said everything was approved and on its way. WTF? Turns out unless a manager specifically rejects a card, they auto-approve in 2 weeks. Huzzah! So, here lies a testament to a broken process. I'm glad he got them because they are funny and the story is great too. Initially, we didn't have formal titles in the Mac group, but we needed to figure out what they were in order to get business cards made. My title with the Apple II group was "Senior Member of Technical Staff", which sounded dull to me. I told Peggy Alexio, Rod Holt's secretary, who was ordering the business cards, that I didn't want any, because I didn't like my title. The next day Steve [Jobs] came by and told me that he heard that I didn't want business cards, but he wanted me to have them, and he didn't care what title I used; I could pick any title that I liked. After a little bit of thought, I decided on "Software Wizard", because you couldn't tell where that fit in the corporate hierarchy, and it seemed a suitable metaphor to reflect the practical magic of software innovation. When I told Burrell [Smith, who designed the motherboard for the original Macintosh, Laserwriter and the Apple IIe] about my new title, he immediately claimed "Hardware Wizard" for himself, even though I discouraged him, since it diminished the uniqueness of my title. And, as soon as word got around, lots of other folks on the Mac team started to change their titles to something more creative. The trend persisted at Apple for many years, and even spread to other companies, but as far as I know, that's how it got started.